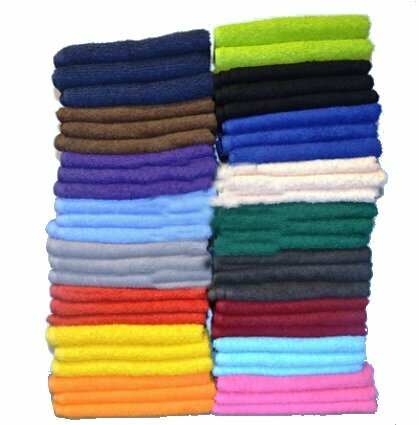 Choose from variety of colors, colored spa hand towels wholesale in size 15X25-(2.4Lb) for spa can be used in Hair salons, Nail salons, Gyms, Country clubs and Golf courses etc. People go to spas to get away from their lives and relax. They want to put their cares behind them and indulge in the pampering that comes from massages, pedicures and facials. Part of your duty when you work at a spa is helping to create that restful environment, and that means taking care of everything your client may need. From offering coffee or tea at the start of the appointment to using the best towels during their treatment, you can make a huge difference in their experience by choosing the best products. Consider our spa hand towels when stocking up on your supplies. Available in a range of colors, including several shades of green and blue, our towels can help clean up messes, wipe down massage tables, cover manicure stations and more. By choosing them in a certain color instead of sticking with the traditional white, you help your spa stand out and give it some personality. Of course, you can always mix in some white towels with some color as well. Why should you buy from Towel Super Center? We offer high-quality products at affordable prices. We understand our customers, and we tailor our products to their needs. Our inventory includes a range of towels made for specific industries, from spas to car washes to hotels. When you get the right towels, they can enhance your customers' experience and bring more repeat business. Durability: Our towels stand up to repeated washing. You likely go through dozens of towels each day, so you need to know they won't break down or become too coarse. Size: At 15x25, our hand towels truly are the size of your hands. If you put them in the restroom, they are the perfect size to dry off with. Color: Pick a color that matches your spa's personality, whether it's vibrant or low key. Do you need many towels for your spa? You probably use them for a range of tasks, so it makes sense to buy a lot of them at once. Purchasing from us in bulk can reduce the price you pay per dozen. The more you order, the more you save. It's another way we are committed to helping our customers and saving them money. With discounted prices and high-quality products, Towel Super Center can help your business save on towels that will last for a long time. If you buy in bulk, you can avoid the hassle of having to order more towels later. Our selection of fun colors adds visual appeal to your spa, which your clients will appreciate. Help create the relaxing and enjoyable environment your customers deserve. Get in touch with us to learn more about pricing on new colored spa hand towels today.